The Card Grotto: VIDEO | Let's Build A Snowman! VIDEO | Let's Build A Snowman! 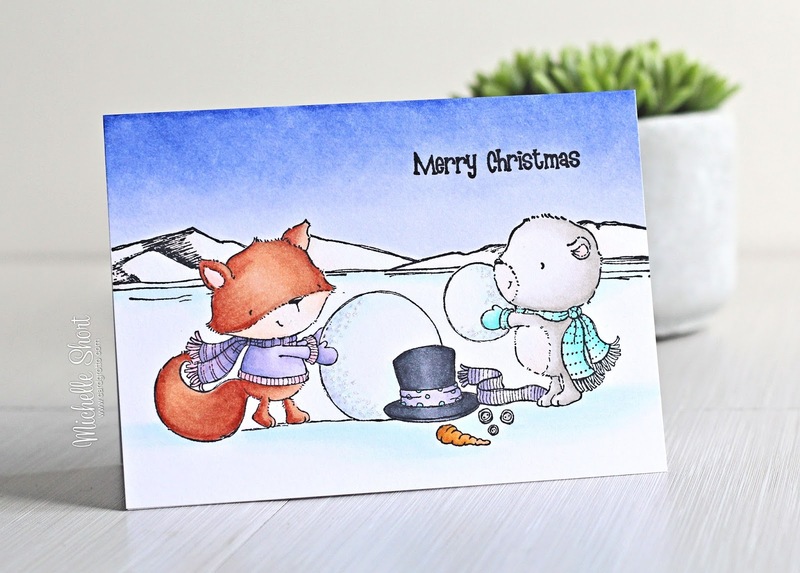 Hello there, have you seen the new release from Purple Onion Designs? It is called Snow Day and it is illustrated by the amazing Stacey Yacula. I have the absolute pleasure to be joining in as a guest for this release. The stamps are so very cute! All of these stamps are sold individually (red rubber) so they are great for building up customised scenes. 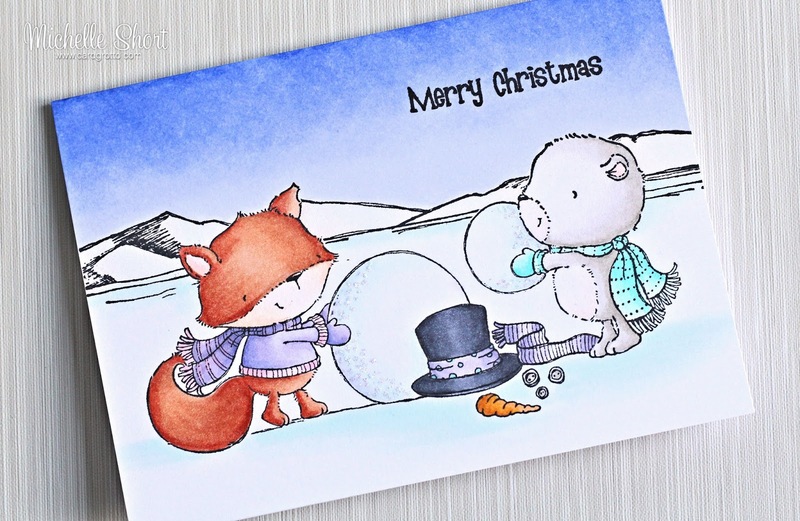 My card today uses the Iceberg background along with Rupert the fox, Wilson the bear and the snowman accessories stamps. I started off by stamping Wilson on the right hand side of a card panel. I then masked him off and stamped the snowman accessories to the side of him. These were also masked off so that I could stamp Rupert to the left hand side. Rupert was also masked off so that I could add in the mountains in the background. The stamp is part of a larger background with icebergs, but I just wanted the mountains for my card today. Once all of the masks were removed, I coloured the whole panel using Copic Markers. The panel was adhered to an A2 card base with ATG (I didn't stamp and colour directly on the card base as I wasn't sure how I was going to add the panel at the time!). To finish off, I added little dots of Star Dust Stickles to the snow balls to give a little shine and sparkle. COPIC MARKERS - Fox: E08, E13, E11, E50, R12, R00. Jumper and Scarf: V25, BV13, BV11, BV00, BV000, RV11, RV10. Bear: W4, W2, W1, W00, E50. Scarf: BG13, BG11. Snowman Hat: C8, C6, C5, V25, BV11, BV00. Scarf: V25, BV11, BV00. Carrot: YR27, YR24, YR12. Buttons: W2. Mountains: E40, E41. Snow: B000, B0000, BG0000, BG70. Sky: B66, B63, B60. I love that they look like they are building a snowman! So cute! For more inspiration using the sets, please pop over to the Purple Onion Designs Blog. Although you can buy the stamps individually, you can also buy them as a set (all 22 stamps) for an amazing discounted price of 30% off until the 10th November. Thank you so much for visiting me today. I hope you have a great day! Totally adorable, Michelle! Congratulations on being a guest designer for Purple Onion. I love Stacey Yacula's images, they are so darn cute! Absolutely adorable...love your sweet critters. Super cute!!!! love your coloring!!! So super cute and thanks for the speedy, colouring video. I would love to give that sky a try, but I think that's because you make it look so easy. I think mine would end up in the bin!